Yeah. How did this happen?? Seems like we were bringing her home from the hospital just yesterday. Supplies: Stamps – Hero Arts, paper – Neenah Classic Crest Solar White, Stampin’ Up! Tempting Turquoise (retired), inks – Hero Arts Fiesta Red, VersaFine Onyx Black, dies – Papertrey Ink, sequins – Lawn Fawn (turquoise), Pretty Pink Posh (clear), dots – Swarovski jet black, flowers – Prima, embossing powder – Stampendous Detail clear. 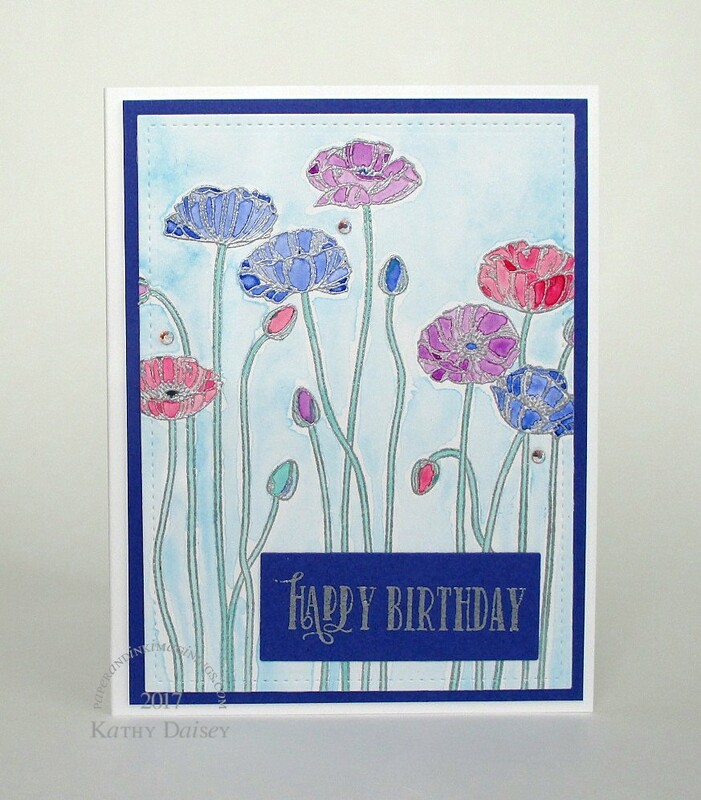 Categories: birthday, card | Tags: card, Hero Arts, Lawn Fawn, Neenah, Papertrey Ink, Pretty Pink Posh, Prima, Stampendous, Stampin' Up!, Swarovski, Tsukineko, VersaFine | Permalink. I immediately cyber scampered over to the gina k. Designs store, to see if the templates were available as a stand alone purchase. Not at this time (I did not ask gina k. if the stencils would ever be a standalone product, and I do not have a crystal ball to read the future.). I didn’t really have the budget available to purchase the stamp set and template package. I made my own template, using lightweight cardstock, acetate (Office Depot transparency sheet), double sided tape, and a Spellbinders rectangle die (cut twice). I cut my cardstock to be 5.5 inches (leaving myself the option to keep it as a square, or to trim it down to make a regular A2 card. The A2 option won because I made a small mistake, and that size allowed me to trim off the mistake. Supplies: Stamps – Essentials by Ellen, paper – Neenah Classic Crest Solar White, Stampin’ Up! Basic Black, inks – Tim Holtz/Ranger Distress Ink Wilted Violet, Tim Holtz/Ranger Distress Oxide ink Peacock Feathers, Picked Raspberry, Salty Ocean, VersaFine Onyx Black, dies – Spellbinders, hotfix pearls – Swarovski Cabochon Jet, embossing powder – Stampin’ Up! Sterling Silver. 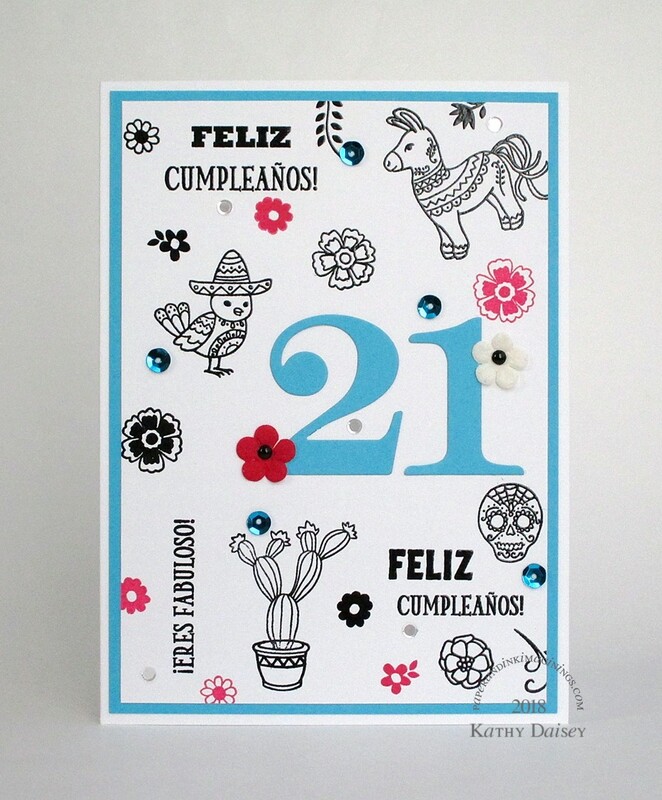 Categories: birthday, card | Tags: card, Essentials by Ellen Challenge, Neenah, Ranger, Spellbinders, Stampin' Up!, Swarovski, Tim Holtz, Tsukineko, VersaFine | Permalink. 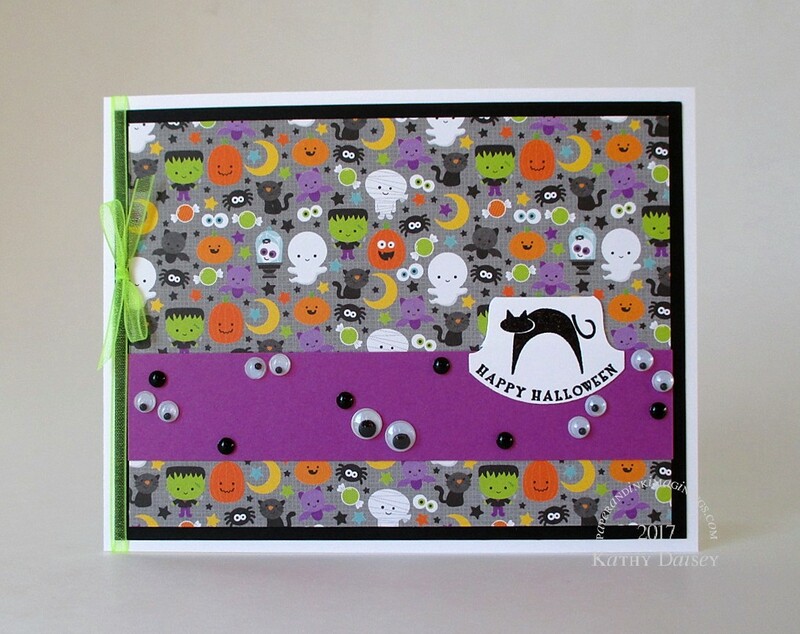 I really love this cute Doodlebug Designs Boos & Brews paper! After I assembled this, I realized I should have added texture to the purple-ish band. DRAT. Should have used an embossing folder. I added black pearls and googly eyes. Supplies: Stamp – Stampin’ Up!, paper – Doodlebug Designs Boos & Brews, Neenah Classic Crest Solar White, Stampin’ Up! Basic Black, Taylored Expressions Plum Punch, ink – VersaFine Onyx Black, punch – Stampin’ Up!, black pearls – Swarovski, googly eyes – Darice, embossing powder – Ranger clear, organdy ribbon – ClearBags. 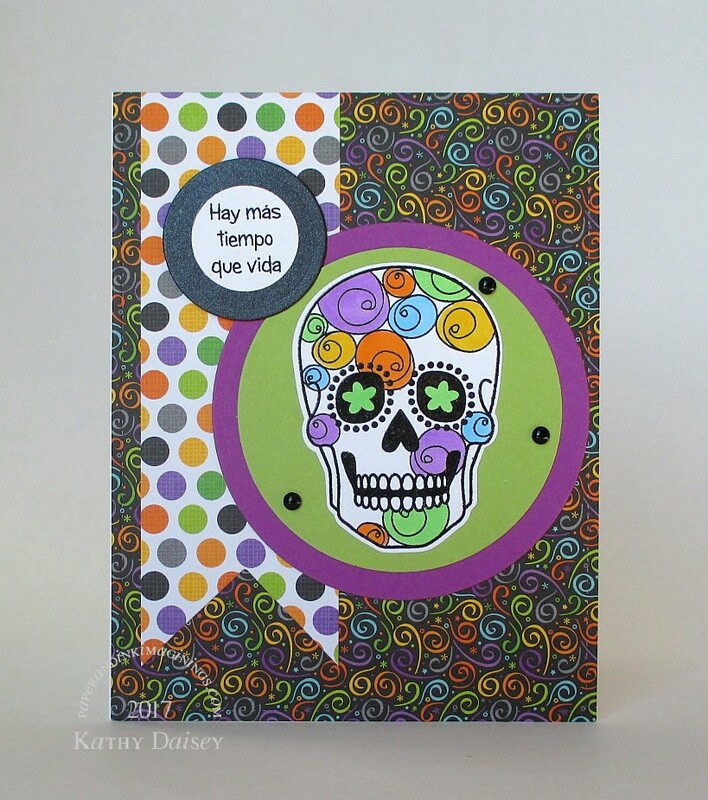 Categories: card, halloween | Tags: card, Darice, Doodlebug Design Inc, Neenah, Ranger, Stampin' Up!, Swarovski, Taylored Expressions, Tsukineko, VersaFine | Permalink. I haven’t participated in a Fusion Card Challenge in a while. (I seem to have fallen out of the challenge cycle, but that could be a post in itself!) 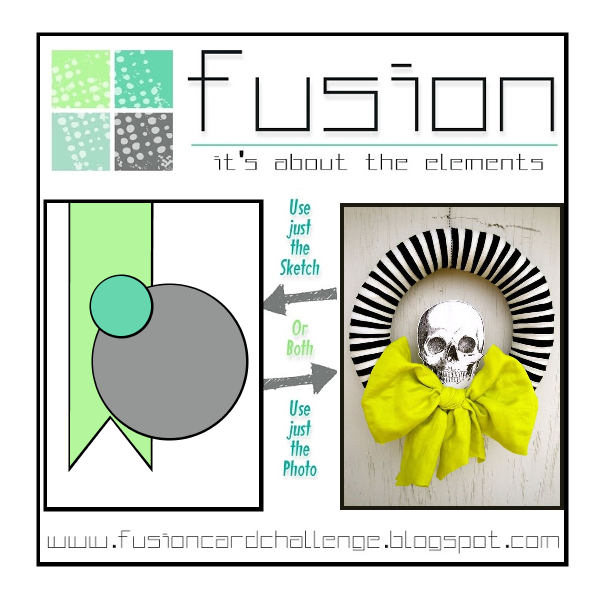 This challenge just jumped out at me – I had it designed in my head in just a few seconds. AND, thankfully, my execution matched that original vision! WOOT! The sentiment translates to “There is more time than life”. (printed on Neenah Classic Crest from my computer) Shout out to Offspring3 for providing me a selection of Dia de los Muertos sentiments. Click here for more information about Dia de los Muertos (Day of the Dead). Supplies: Stamp – Simon Says Stamp, paper – Doodlebug Designs Boos & Brews, Neenah Classic Crest Solar White, Poptone Sour Apple, Stardream Metallic Onyx, Taylored Expressions Plum Punch, inks – Copic B02, V04, YG06, YR04, Y18, VersaFine Onyx Black, dies – Lawn Fawn (stitched rectangle), Simon Says Stamp (skull), Spellbinders (circles), jet pearls – Swarovski, embossing powder – Filigree Fine Art Powder clear. Categories: card, holiday | Tags: card, Copics, Doodlebug Design Inc, Lawn Fawn, Neenah, Poptone, Spellbinders, Stardream, Swarovski, Taylored Expressions | Permalink. Another favorite floral stamp from my collection! I embossed in silver, then watercolored with Sakura Koi watercolors. Supplies: Stamps – Clearly Besotted, Stampin’ Up!, paper – Neenah Classic Crest Solar White, Pop’Set Infra Violet, Tim Holtz/Ranger Distress Watercolor Cardstock, ink – VersaFine Smokey Gray, dies – Lawn Fawn (stitched rectangle), Spellbinders (rectangle), watercolors – Sakura Koi, crystals – Swarovski Aurora Borealis, embossing powder – Ranger Silver Pearl. Categories: birthday, card | Tags: card, Clearly Besotted, Lawn Fawn, Neenah, Pop'Set, Ranger, Sakura, Spellbinders, Stampin' Up!, Swarovski, Tim Holtz, Tsukineko, VersaFine | Permalink. This tag is for the Ellen Hutson 12 Tags of Christmas with a Feminine Twist 2016 Challenge. (that is a mouthful!) It is a BIG challenge, and I love it. 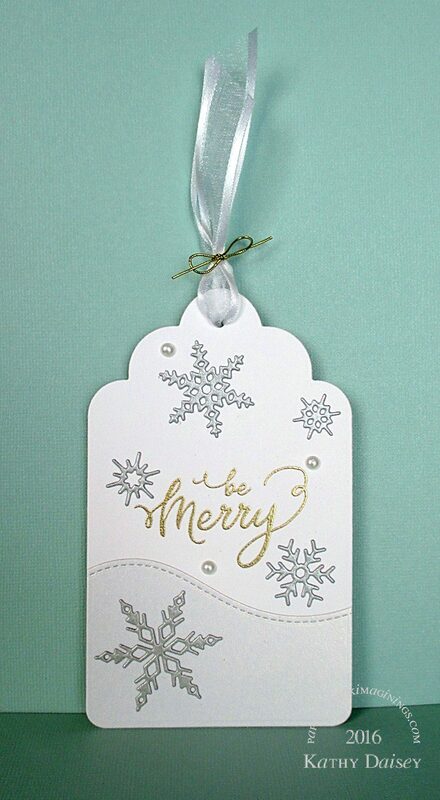 My tag was inspired by the Day 9 tags by Sharon Harnist and Jean Manis – Sharon challenged me to use frosty white with silver or gold metallics. Me, being the overachiever that I am, used silver and gold, and a shimmery white that has a touch of gold. And pearls. The back of the tag is gold, with silver embossing. The challenge runs through December 17, 2016. AND, there is going to be a random drawing from all of the qualifying entries for $150 gift certificate to the Ellen Hutson store. Have you posted an entry yet?? Supplies: Stamp – Essentials by Ellen, paper – Curious Ice Gold, Neenah Classic Crest Solar White, Stardreams Gold (back of tag), Silver, ink – VersaMark, dies – Impression Obsession (snowflakes), Lawn Fawn (stitched hillside), Taylored Expressions (tag), Swarovski pearls, embossing powder – Stampendous! 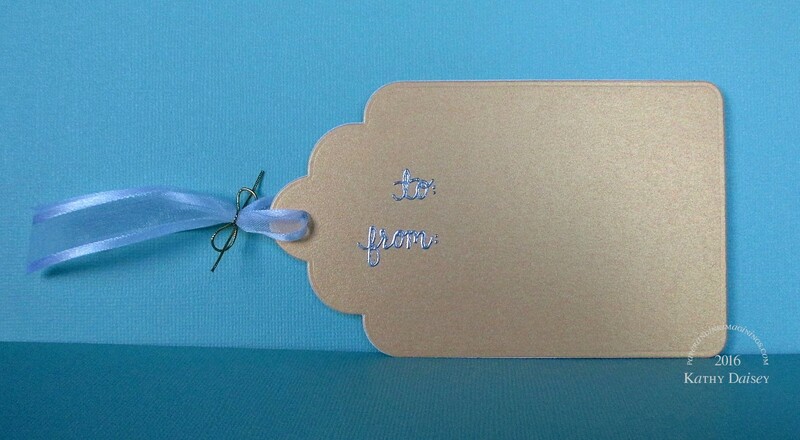 Gold Detail, gold cord – Stampin’ Up! (retired), organdy/satin ribbon – PaperMart. Categories: gift tag | Tags: Curious Metallic, Essentials by Ellen, Essentials by Ellen Challenge, Impression Obsession, Lawn Fawn, Neenah, PaperMart, Stampendous, Stampin' Up!, Stardream, Swarovski, Taylored Expressions, VersaMark | Permalink. 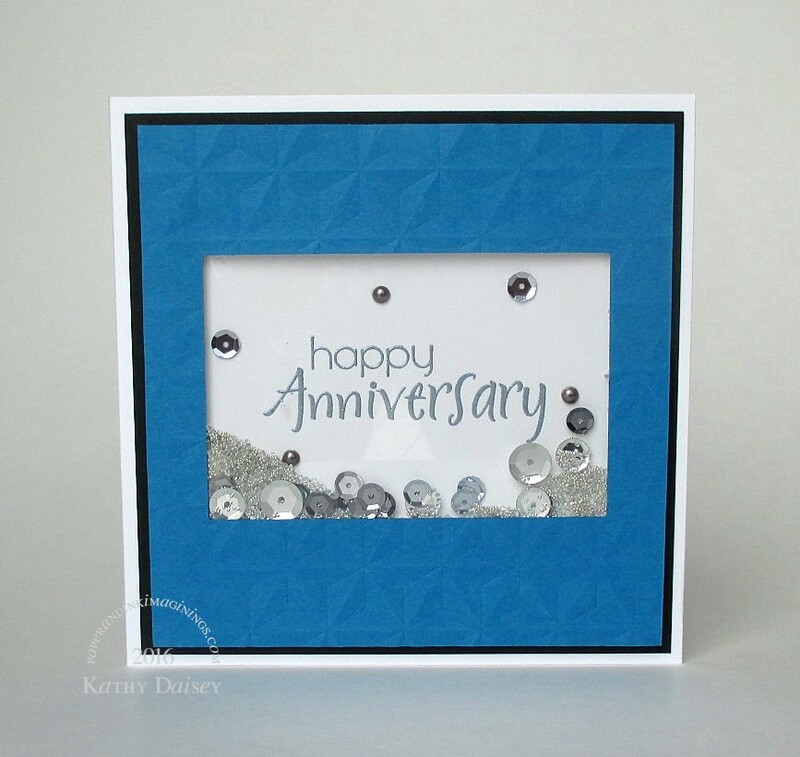 A Silver Anniversary card (all the items in the shaker are silver or clear) for personal use. The “25” is on the inside of the card. Supplies: Stamp – Rubber Stampede, paper – Neenah Classic Crest Solar White, Office Depot transparency, Stampin’ Up! Basic Black, Pacific Point, ink – VersaFine Deep Lagoon, die – My Favorite Things, embossing folder – We R Memory Keepers, sequins – Darice, Doodlebug Design Inc, Lawn Fawn, Studio Calico, silver pearls – Swarovski, microbeads – source unknown, embossing powder – Ranger Silver Pearl. Categories: anniversary, card | Tags: card, Darice, Doodlebug Design Inc, Lawn Fawn, My Favorite Things, Neenah, Ranger, Stampin' Up!, Studio Calico, Swarovski, Tsukineko, VersaFine, We R Memory Keepers | Permalink.